Remember the Guild Literary Complex Prose Awards contest? Well, today we are very excited to announce that current M.A.W.P. student Lisa Applegate has been selected as one of 3 semifinalists for the 2011 Prose Award for Short Non-Fiction. Not only that, but Lisa’s piece is an edited version of one she wrote for Brenda Fowler’s class on writing in Chicago last winter quarter. That means Lisa will be reading her submitted piece at the recognition event, and that she is still in the running to receive this year’s award and cash prize. The event will be held this Wednesday, Nov. 2nd at 7:30pm at the Chopin Theater 1543 W. Division. The recognition event is open to the public and admission is $7 general/$5 students. Attendees will enjoy a lively evening of prose and music, and of course be able to vote in the Audience Favorite portion of the evening, so if you’re free, come out and support Lisa and enjoy a great literary event. Once again, congratulations and good luck to Lisa Applegate! The latest call for papers comes from DePaul’s own Humanities Center. 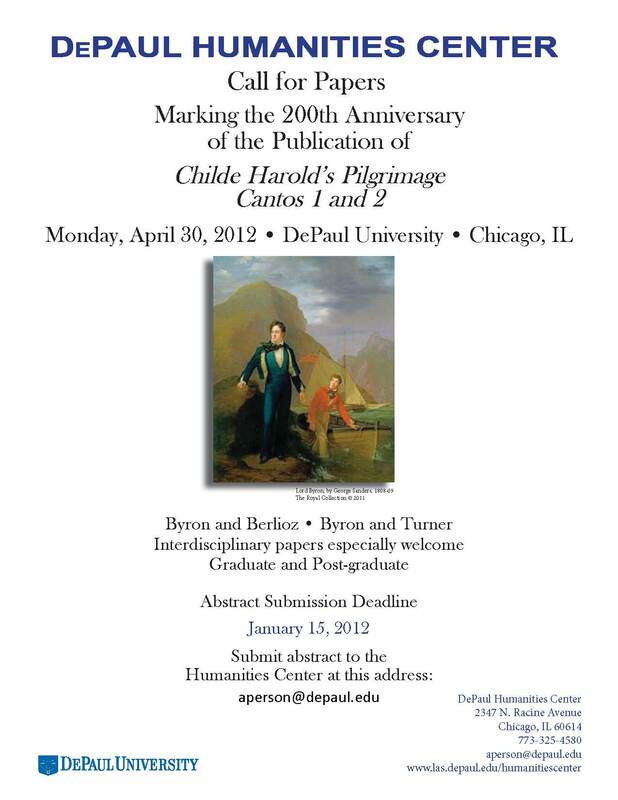 On April 30th, 2012, The DePaul Humanities Center will present a conference commemorating the 200th anniversary of the publication of Byron’s Childe Harold’s Pilgrimage. The conference will be keynoted by Christine Kenyon Jones, of the University of London, and Peter Graham, of Virginia Tech. The deadline for the submission of abstracts is January 15, 2012. The Humanities Center is especially encouraging submissions from graduate students. Abstracts should be sent to aperson@depaul.edu. For more information, see the attached flyer, and visit http://las.depaul.edu/humanitiescenter/. The DePaul Can: University-Wide Food Drive will take place Nov. 7th through Nov. 11th. DePaul Can is a student-led initiative uniting the DePaul community in the fight against hunger, bringing together students, faculty and staff in a Vincentian way. Last spring, DePaul Can collected more than 700 pounds of food for the Greater Chicago Food Depository (GCFD). Please help the College of Liberal Arts and Social Sciences show their support by donating non-perishable food items between Nov. 7th and 11th. DePaul Can has arranged for three different collection areas for your convenience. You will find drop-off boxes located on the 5th floor of SAC in the outer hallway north of the stairwell, in McGaw on the 2nd floor in the student lounge area, and on the first floor of the 990 Fullerton Building in the hallway next door to the LAS Technology Center (suite 1600). DePaul Can student team members will pick-up the donations and deliver them to the GCFD. The Committee on Interdisciplinary Studies at De Paul University invites proposals to present papers at the First Annual Interdisciplinary Studies Conference to be held on May 30, 2012 in Cortelyou Hall. Pulitzer Prize winning journalist Isabel Wilkerson, author of The Warmth of Other Sons, will present the Keynote address. The conference will give students interested in interdisciplinary work to share their work with one another. The conference will also be a lively forum for scholars, educators, and professionals who are interested in issues relating to any aspect of shifting and crossing borders, domestic and global migration flows, immigration and/or multiculturalism. The Conference will be a forum for the exchange of ideas and the sharing of various approaches and perspectives on presenters’ chosen topics in an informal interdisciplinary setting. Please email abstracts to Farrad DeBerry at fdeberry@depaul.edu on or before February 15, 2012. The University Graduate School of the University of Birmingham in England is pleased to announce that it has ten Elite Doctoral Researcher Scholarships available for the 2012-2013 academic year. The University Graduate School is looking for students with outstanding academic records and both literature and creative writing candidates can apply. For more information, visit their information page. Questions may be sent to Rachel Patti at r.c.patti@bham.ac.uk . It is with sadness that we have learned of the death of M.A. in English student Warren Scheideman, a faculty member in the School for New Learning. Warren passed away on August 25. He was a very enthusiastic student of literature who was pursuing a life long dream of obtaining an MAE. He taught at DePaul from 1984 until his passing, and was highly respected among his friends and colleagues. The Degree Progress Reports for graduate students in LA&S are in the process of being updated and should be completed by the end of the year. We have been working with Nora Durkin, the Associate Director of Graduate Student Services, to provide information that will make the DPRs an accurate representation of a student’s academic career and a trustworthy tool for Degree Conferral audits. In the meantime, if you were admitted to the either the MAE or the MAWP before 2009, please continue to contact Jan Hickey during the quarter previous to the one in which you plan to apply for degree conferral so that she can check your Unofficial Transcript to confirm that you have completed your degree requirements. If you were admitted to either the MAE or MAWP before 2009, continue to contact Jan Hickey jhicke11@depaul.edu for a degree conferral review of your Unofficial Transcripts. If you were admitted to either the MAE or MAWP after 2009, you can use your DPR to monitor your progress toward degree completion. Look for the new quarterly LA&S Graduate Student Services Newsletter which should be appearing later this quarter. There soon will be online forms for English 500 The Independent Study, English 501 Thesis and English 509 Internship. More information on this can be found in the upcoming first issue of the LA&S Graduate Student Services Newsletter. Please remember that the Final Requirements form, for students completing a thesis, is a separate form from those listed above. Two upcoming Career Center events will cater specifically to English Students, and all MAE and MAWP grad students are encouraged to attend. Wednesday, Nov. 9th, from 6-7:30 in the Dorothy Day Room #400 of the LPC Library- Career Panel for English Students featuring Betsy Crist, Lisa Spengler, Perrin Davis, and Chris Green. -9:00p.m. 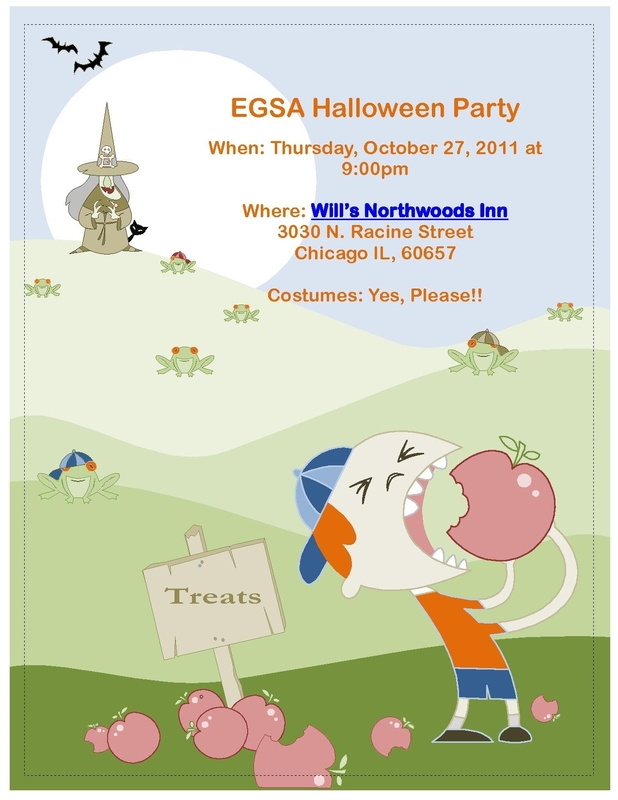 EGSA Halloween Party at Will’s Northwoods Inn, all MAE and MAWP students welcome! Lots of exciting upcoming events to talk about today! Oh, and have you liked the DePaul University English Graduate Programs on Facebook yet? Well, what are you waiting for?! The English Graduate Student Association (EGSA) cordially invites all MAE and MAWP students to attend their second-annual Halloween Party, this THURSDAY, OCT. 27TH. Yes, that is TOMORROW, so we hope you can make it for an evening with your fellow English Graduate Students. The party will be held at Will’s Northwoods Inn, located at 3030 N. Racine Street, just blocks away from the Wellington Brown Line stop, not too far from the Lincoln Park Campus. Festivities will begin at 9pm, but don’t hesitate to come late if you have class. EGSA has reserved a private party room for the event so you don’t even have to worry about finding a seat. Costumes are encouraged! Click to enlarge the attached flyer, and email egsa.depaul@gmail.com with any questions. This Thursday, Oct. 27th is not just the EGSA Halloween Party, it’s also the first of many readings to take place at the new DePaul Art Museum, located at 935 W. Fullerton. 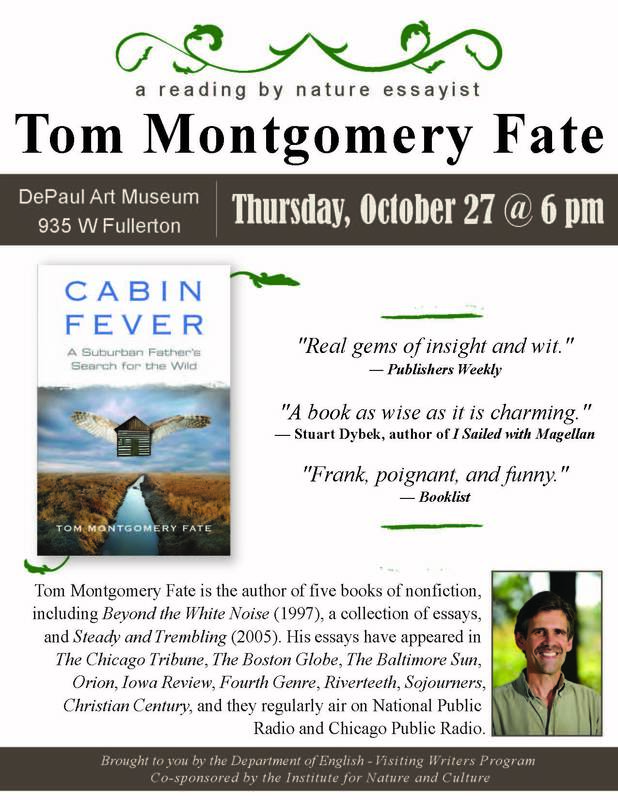 Join the Department of English- Visiting Writer’s Program and DePaul’s Institute for Nature and Culture as they present a reading by the irreverent and insightful nature essayist, Tom Montgomery Fate. 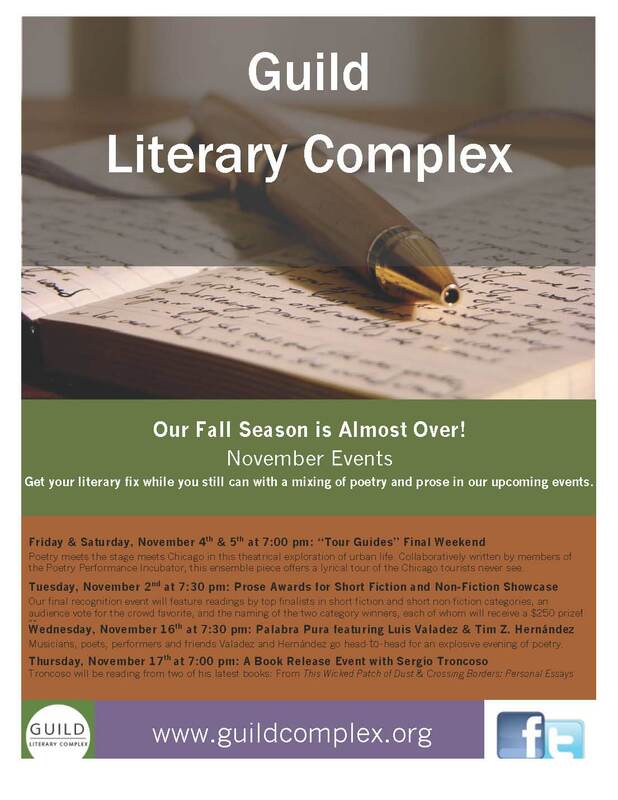 The reading is free and open to the public, and will begin at 6 p.m. (leaving you plenty of time to change into your costume and meet up with EGSA). Details on all these events can be found on the flyer, and as always, visit www.guildcomplex.org for more information. Exciting news for social media aficionados: DePaul University English Graduate Programs is now on Facebook! If you’re a Facebook user, hop on over and “like” our page to connect with your friends and classmates and get even more updates on your favorite graduate programs. The deadline for Tennessee Williams/New Orleans Literary Festival’s Fiction Contest is approaching fast, and the organizers are excited to unearth new writing talent. Amy Hempel, the master of the short form, will serve as the contest’s judge. If this isn’t enough of a draw to enter, it might help to know that they’re also offering a $1,500 grand prize plus a trip to New Orleans for the 26th Annual Tennessee Williams New Orleans Literary Festival to the winner. Entry fee: $25 per entry. Unlimited entries per person. 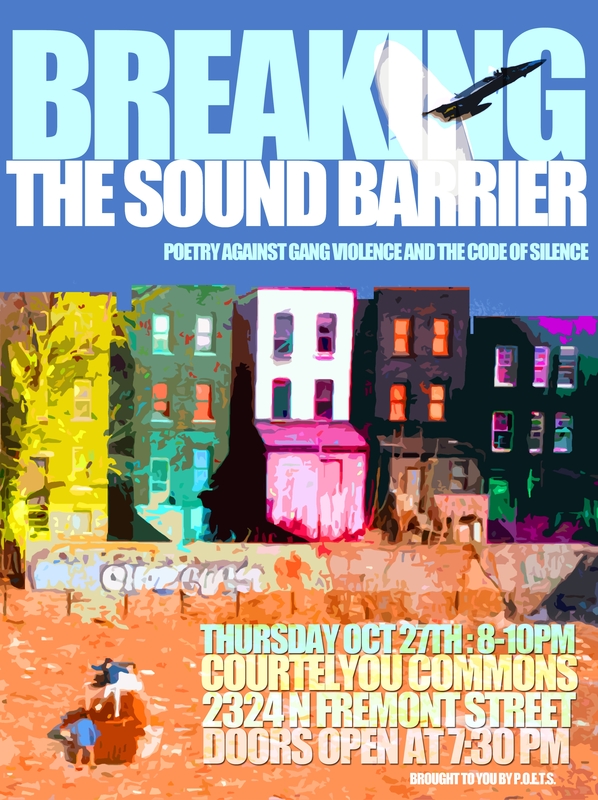 The Presenters Of Enlightenment Through Spoken word poetry organization on DePaul’s campus has an event coming up this Thursday, Oct. 27th from 8-10pm at Cortelyou Commons. The event will be a performance of spoken word poetry addressing issues of gang violence and the code of silence. Click on the flyer for more details. Congratulations are due to Christine Sneed, who has just sold a novel, Little Known Facts, to Bloomsbury. And her short story, “The First Wife,” which appeared in the December2010/January 2011 issue of the New England Review, has been selected for this year’s O. Henry Prize Anthology. Congratulations also to Lesley Kordecki on the publication of her new book, Ecofeminist Subjectivities: Chaucer’s Talking Birds, which analyzes the interaction between gender and species in Chaucer’s poetry and interprets his adaptation of medieval genres through an ecofeminist lens. The book is a part of Palgrave Macmillan’s New Middle Ages series. Next time you see Prof. Sneed and Prof. Kordecki, make sure to congratulate them on these outstanding accomplishments! Radio DePaul is looking for two Co-hosts for a show featuring creative writing students reading their work on air. It will be the hosts’ responsibility to work with the student programmers at Radio DePaul to shape the show, to host the show on the air, and to select student readers for each show. They are anticipating doing a one hour show every other Friday morning. Please submit a 1-page application letter to Professor Dan Stolar’s mailbox in McGaw by Wednesday, Oct. 26 if you are interested. Note: it is likely that there will be overlap between applications for these positions and for the Threshold Co-editor positions. Please feel free to re-use materials from that application. The same people will not be chosen for both in order to give more students an opportunity. Currently celebrating its 25th Anniversary Season, Regional Theatre Tony Award recipient Chicago Shakespeare Theater is seeking qualified and enthusiastic interns for the Advancement, Education and Marketing/PR Departments for at least a 10-week period between January and June of 2012. Preference will be given to candidates who can work a minimum of 25 hours per week. A small weekly stipend will be provided. Current students, graduates and early career professionals are encouraged to apply. All applications must be received by Monday, Nov. 14th. View the detailed posting for each position here, and the full internship descriptions and qualifications on the Chicago Shakespeare Theater website. Happy National Day on Writing, everyone! How are you celebrating writing today? Perhaps by catching the Essay Fiesta performance coming up in the student center? And have you been checking Winter 2012 for course descriptions? We’re right in the middle of registration week and almost all of them are up. Best of luck to everyone registering for classes. Grad Students: If you ever have an issue you would like to bring to the DePaul Student Government Association (SGA), Morgan Taylor is your representative on the 2011-2012 SGA Senate. Morgan Taylor is the Senator for Graduate, Law, and Adult Students. She can be contacted any time at Morgantaylor1989@yahoo.com. For more information on the DePaul SGA, visit sga.depaul.edu. The Department of Foreign Languages and Literatures at Purdue University is excited to announce a call for papers for the upcoming graduate symposium themed “Global Perspectives on Linguistic Studies”. They welcome submissions in all areas of Theoretical and Applied Linguistics. An anonymous abstract of no more than 300 words must be submitted in PDF format to the Graduate Symposium Committee by Dec. 15, 2011. In your e-mail submission please include the presenter’s name, institution of affiliation, e-mail address, and phone number . Please do not include any identifying information on the abstract itself. You will be informed of the committee’s decision after January 15, 2012.